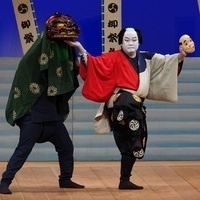 Nakamura Gankyō (AKA Bandō Hirohichirō) and his students will perform selections from Kabuki plays as well as demonstrate what goes into creating a Kabuki character through performance. Audience participation encouraged! Please input your membership number for your discount. $10 discount for USC students, faculty, and staff. You will be asked to show your ID at the door or pay the difference in cost. Please email bethany.wearden@pam.usc.edu for your discount code.